The U.S. job count has grown by nearly 15.8 million positions, or 16.2%, since the end of the Great Recession. New York City has been the nation’s job growth leader during the current cycle, with the addition of over 1 million jobs. Those new positions increased the existing job base about in line with the national average at 16.5%. Job gains in the past eight years reached almost 600,000 positions in Dallas, Houston and Los Angeles. Dallas saw its existing employment base surge by 29.3% during that time frame, while additions increased the Houston economy by 21.9%. Meanwhile, job growth upped the LA base by a more moderate 13.8%. 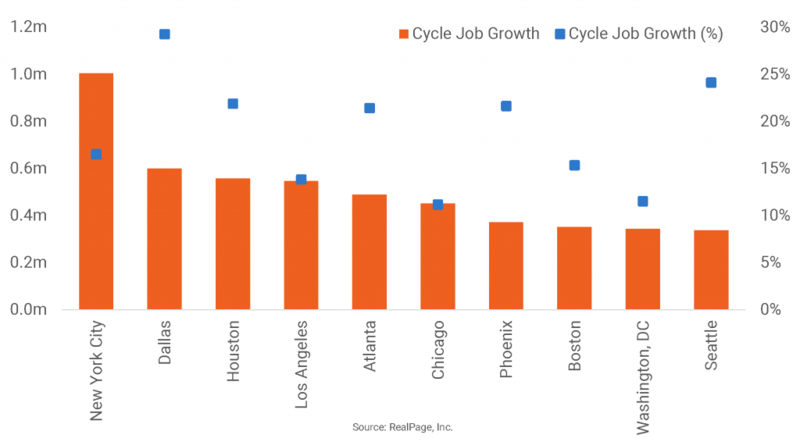 Employment gains were close to 500,000 jobs during the cycle in Atlanta and Chicago. This progress swelled Atlanta’s base by 21.4%, while the increase was more moderate at 11.2% in Chicago. Logging additions between about 350,000 to 400,000 jobs were Phoenix, Boston, Washington, DC and Seattle. Of those, Seattle saw its job base jump 24.1%, while Phoenix wasn’t far behind with a 21.6% increase. Employment growth was at 15.3% in Boston and 11.5% in Washington, DC. Since 2006, Kim has worked as a researcher, analyst, and writer for RealPage, developing a deep knowledge of data methodology and application.